On Thursday, 28th December 2017, in Mashhad the second most populous city in Iran, thousands of protesters gathered outside the city hall and chanted “Death to Rouhani”, the country’s President. Some reports have suggested that it may have been initiated by the conservative cleric Ebrahim Raisi, Rouhani's defeated rival in the May 2017 Presidential election. Later on, some others, including the senior officer of the Islamic Revolutionary Guard Corps, implicitly accused ex-President Ahmadinejad's circle being behind the recent protests. However it may have started, it quickly broke out of its intended framework and control and, in less than a week, spread to over 40 cities. 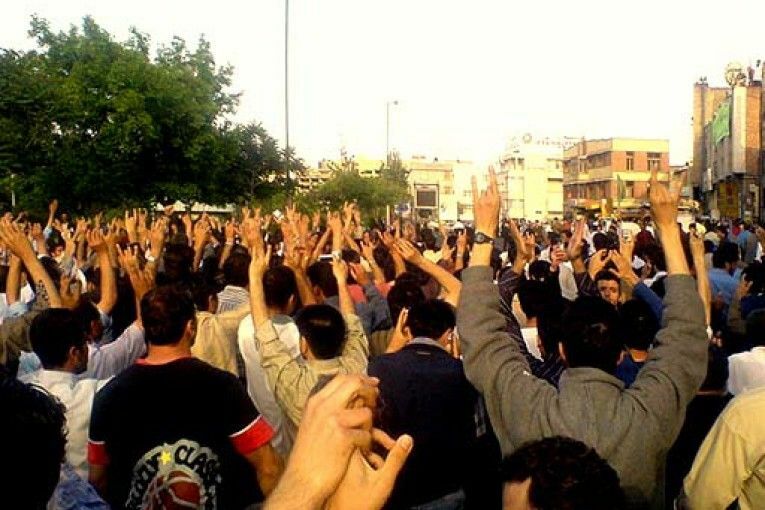 Then, increasingly they became anti-regime protests, targeting both conservative and the reformists alike. It did not even spare the “Supreme Leader”, and calls of “Death to the Dictator”, “Death to Khamenei” were heard loud and clear in most cities. These outbreaks are fundamentally a product of economic grievances and its root lies nowhere else but in the capitalist system itself and its long lasting crisis. Things got worse, when several banks and financial institutions, sometimes run by such regime institutions as the Revolutionary Guards, brought investors who had lost their investment, on to the streets to protest in direct confrontation with the security forces . At the same time a campaign of "I regret having voted for Rouhani" filled social media for several weeks. More importantly Iran's involvement in imperialist proxy wars became more and more evident and costly, both economically and in terms of the human cost, as coffins of Basiji and Revolutionary Guards corps came home. Finally, the government's draft budget  which was submitted to parliament on 10 December 2017, brought further hardship by cutting fuel subsidies yet again. As usual, the proposed budget measures for the rich were a different story and extremely generous, in particular towards the official religious institutions . Witnessing sudden outburst and riots in the near future is almost certain, but the question is how to fight back. Above all, it seems that the various policies of the various political factions, including the reformists, towards these particular protests, have been worked out with an eye to the post-Khamenei period. Internal faction fighting within the regime is gathering pace very quickly. It has been reported that Khamenei's cancer can no longer be treated nor contained. Now all factions are preparing for a post-Khamenei period, with a possible election or maybe just the selection of a new leader by the Assembly of Experts. The recent activities of the circles around ex-President Ahmadinejad who have attempted to appear as opponents of the regime (!) is a good example of this. The absence of Rafsanjani  and his usual intrigues and manoeuvring, may prove to be critical in the near future for the Islamic Republic. On top of this, imperialist rivalry, with the election of Trump is getting sharper. “The only way out of this situation is to intensify the class struggle and recognise the fact that our emancipation, as a battalion of the world proletariat lies in the emancipation of all the other battalions of the world working class. At no point in history, has our destiny been so intertwined as it is today and never before has the formation of an internationalist party been so vital and so necessary. Akbar Hashemi Rafsanjani, billionaire cleric and former President of Iran was regarded as the “kingmaker” of the regime. He was a supporter of both the appointment of Khamenei as Supreme Leader and Rouhani in the 2013 election. He died in January 2017. See Thirty Years of Islamic Iran – A Warning from History at leftcom.org for more on the original “revolution”. Its not a neither/nor. We have to applaud any fight against austerity and exploitation (it is part of the class struggle) but we also need to know that this protest or riot is not enough - it has to have a bigger purpose or greater ambition. Who knows that this is not the end of the story but it will take time, consciousness and a very widespread movement to unhinge the control of the regime which has now lasted for almost 40 years. At least this one shows that "God" is no longer "great".